Which Founder Are You? Take this brief quiz to determine which U.S. Founder you are most like. Lincoln’s Crossroads: What would you have done in Lincoln’s position? Bill of Rights game: The Official National Computer has crashed. Your mission: Rebuild the document by finding the missing rights and freedoms in Freeville. Lesson plans from Thinkfinity’s Edsitement: Content-approved Featured Lesson Plans run along the left side of your screen. 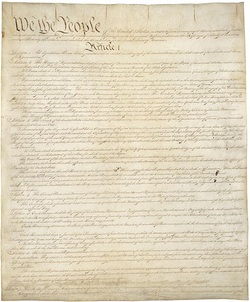 “Constitution Primary Source Set” from the Library of Congress. Includes Teacher’s Guide. *Historical fiction titles relating to the Constitution and civil liberties are available. Please ask Mr. Sparks for recommendations.